I keep saying that I will post on a more regular basis but let’s be honest here….this isn’t my life. Yes, I actually do other things and go out in the world to enjoy it. Between teaching and studying karate, I’m almost a ninja, and my job, it is hard to stay up on posting on facebook, keeping my website up to date and posting here life becomes maddening. So bear with me one more time. Here is what I have been up to since November. So Thanksgiving is approaching quickly. We are not a traditional Turkey and ham kind of family. None of us like Turkey and ham has a tendency to be a bit salty so over the past several years, I’ve whipped up a bread cornucopia and filled it with all the things we love…..chocolates, fruits, nuts, cheeses, and so on. It has become a yearly tradition along with a pumpkin and pecan pie. So this week I bring all that is Thanksgiving. From bread cornucopias and yummy sauces, to pies and breads. As usual, enjoy! So yes, I have been missing in action once again. With the unexpected death of my Mother, life became a bit complicated for awhile. But here I am again! Let’s get started with a post of a few things I have made over the past many, many months. So yeah, it’s been since Easter weekend that I posted and for some of you that meant egg hunts and visits from the Easter Bunny! Happy Hunting! But not only did I make a traditional Easter bread but a few other tantalizing simple dishes. For Easter I want to give a few bread options, Paska and a Braided Cinnamon Roll. For the Fresh n’ New I served up a Skirt Steak Salad and a 5 minute salad. Everything can can be made for a Sunday morning brunch whether for Easter or any other time. I will be back soon with photos and updates from the past several months soon. Well, I’m back with some more posts. I have some major catching up to do. So for those of you who don’t know I teach karate as well. I’ve really just started my dojo and I have been really focusing on my students as well as my training. So I have blown the food posts off lately. I apologize and I am really going to try to stay on task. So without further ado, here is what I have been cookin’ n’ bakin’ lately……. So I know a lot of people have tried cauliflower crust but have you tried zucchini? I found this once again on recipegirl.com and at first I wasn’t buying it. But I decided to give it whirl and honestly I find it much better than cauliflower. It has not strange after taste and holds really well. Zucchini really doesn’t have a flavor so you can add your favorite seasonings to really make a flavorful crust that compliments your toppings. Get creative and feel free to spice it up a bit. Next up: Salted Caramel Chocolate Baked Doughnuts & Old School Vday Cookies. I added a good dash of Butterscotch liqueur to the caramel sauce and honestly that really made those doughnuts happy! The Vday cookies are just decorated with royal icing. Nothing fancy but always pretty to look at. Moving onto Coconut Sauce Salmon with gingered jasmine Rice. The dish isn’t glamorous to look at but it is really tasty. I love a good piece of salmon and the I love coconut so the both together made for a decadent and savory dish. I highly recommended this one. Zucchini Pizza Crust: Yup another veggie turned into a crust. I’ve done the cauliflower one so I thought why not try zucchini. I like the zucchini version better. To me it was easier to make and I don’t enjoy the smell of cooked cauliflower so this was a bonus as well. Plus the green color is awesome! Up next and only a few more to go: Black Bean Bowls and Tomato Florentine Soup. Paired together these two simple dishes make a complete meal. Both are so pretty to look at. The layered bean dish in a clear cup looks elegant and the red florentine soup just completes the whole southwest theme. Super tasty, super easy! White Chocolate Truffles: What to do with leftover ganache and white dipping chocolate? Make truffles. Very easy and super easy to eat too many in one sitting. I am not a white chocolate lover but these were still pretty good. My husband had to torture his taste buds by eating most of them, ha, ha. And now for my last entry and I will be up to date! Hip Hip Hooray! So last week or so I made a Greek Dip. A lighter dip than most, the main dipping component is hummus and it is generously topped with kalamatas, cucumber, and tomatoes. Use your favorite chips or pita chips to dip and dip and dip, and, dip. Ok you get the point. Today I made Green Waffles. Recipegirl had a post for a green smoothie waffle and I was going to pick up some spinach and make a smoothie waffle version of my own but I got too lazy so I just added a healthy dump of Matcha into my favorite Belgian Waffle recipe and voila, lovely green waffles. In advance…Happy St. Patricks Day! So, as many of you know, I am not a meat eater but I really want to be able to cook it and cook it well. Fortunately, I have a couple brave souls who are willing to sacrifice their taste buds. I received an A+ for this round. Lamb may scare a lot of people off but it really isn’t that difficult. Yes, it is rather delicate and easy to overcook but if you follow the directions you will have no problems. This is a simple recipe; basically a rack of lamb, cut into 10 – 12 chops, topped with a chimchurri sauce of arugula, parsley, garlic, oil, red wine vinegar, and cumin. The recipe is adapted from Country Living and the dish really makes an impressive meal but only takes 30 minutes or less to prepare. I highly recommend this dish for that special night or just a chill evening with a nice glass of wine. So I have become very bored with my cooking and baking lately and I began thinking about what I could do to become more excited about cooking. I want my clients who come to class to be excited as well. Amazingly I googled “I am bored with my cooking.” and I found a lot of new to me recipes that were simple and most were light and fresh as well. Below is the first in my series of “Fresh & New”: Grilled Sea Bass with Salsa Verde. First off if you can’t find Sea Bass just use your favorite firm white fish. Remember to heat your pan before placing your fish skin down into the pan. This will give that skin a nice crispy texture and a beautifully brown color. It can take practice so don’t get discouraged if the first couple times your skin isn’t as crispy as you like. The recipe only uses a handful of common ingredients, another plus in all the recipes I found, and literally takes less than 30 minutes from start to finish. I can’t get green tomatoes in my area so I used a small can of salsa verde and pureed in the cilantro. The fish is garnished with tomato and red onion. No resolutions here! Just food and other food associated tips. I realized I have been bored with my cooking and baking lately and I want to create and add new things to my weekly menus. I was told that the average person eats/prepares the same 15 – 20 meals on a regular basis. Think about what you’ve eaten/ cooked over the past few months. What about what you ate at restaurants? Gotcha! We all do it and we are all creatures of habit. There is nothing wrong with that. I’ve just become very bored and frustrated with the same dishes. I will be throwing in new recipes every so often. Recipes will easy to make with no obscure ingredients. Simple, clean, and fresh. So join me on my adventure and feel free to let me know what you are up to as well. Finally back and with a food! Sorry, sorry, sorry. I got so caught up with thousands of other tasks I neglected this little blog of mine. 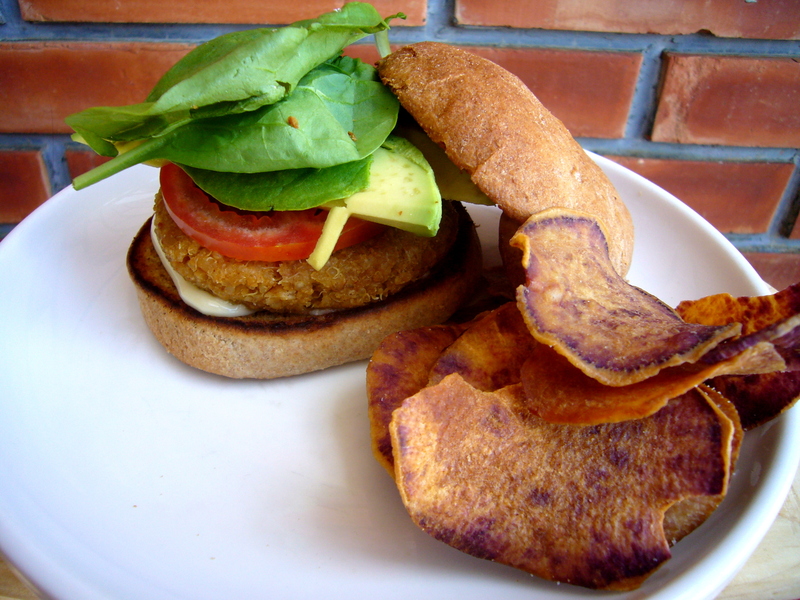 In a nutshell I made a Quinoa Burger seasoned with chipotle powder and garlic. Topped with avocado, tomato, spinach and your choice of condiments then voila feasting time. Oh, don’t forget the side of beni imo chips…..